SF Taxi Media: Passenger Comments On Taxi TownSF, Wants Some Answers! By John Han. Passenger Comments On Taxi TownSF, Wants Some Answers! By John Han. A San Francisco resident, apparently living here for 15 years, has posed a few questions to Taxi TownSF. The anonymous inquirer claims to be a regular taxi rider and wants to know why it is so hard to get reliable phone service. The post was submitted to this website under the category that used to be called "Comments and Cab Stories". But because of the rider's questions, I decided to change that heading to "Ask A Cab Driver". If more riders know about an online page where they could ask cab drivers questions, hopefully a section of this website could help offer enlightenment. Here are the rider's questions and then my answers. Hi Anonymous, and thanks for your question. And thanks for being the first one to ask a question. Hopefully, this will get more people started. The public rider-ship is deceived, in my opinion, because it is generally under a notion that taxi companies are there to provide it with taxi service. They are not. Take, for example, a comparison such as a pizza delivery service. If the pizza shows up within 45 minutes as promised and the food is good, then you’re happy. But if it takes 90 minutes, or it never shows up at all, then you’ll be upset and will never call that company again, and the restaurant risks losing your business. This is where I feel, as I’ll try to explain, the riders are being victimized, when similarly trying to request taxi services by phone. It may sound odd, but taxi companies are not in business to service the actual riders themselves. And their profit and loss margins are not dependent upon the volumes of rider-ship the same way pizza services could be heavily dependent upon volumes of pizza delivery. There’s an element of false advertising in their business model. Taxi companies are car rental companies making primary money by charging taxi drivers rental fees for use of the company owned vehicles. The taxi drivers are considered their primary “customers”, paying fees into the taxi companies for their “company provided services”. So, taxi company revenues are secured, as long as they are leasing their taxicabs to drivers, not whether you are getting your cab in a timely manner, or get it at all. It is of no financial risk for them if they fail to ensure that you, the rider receive customer satisfaction. Again, taxi companies do not exist to service you. 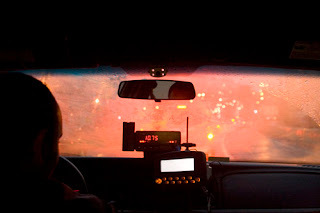 And it is no financial risk to them if you are unsatisfied with the City’s taxi service. However, they still by and large hold the monopoly over the dispatch systems. That means that if there are empty cabs near your area and could get to you within minutes but none of them belonged to the company you called, then they would not know you’re requesting a pickup, and you could therefore have to wait longer for the one cab that’s from the company you called. Having to call only one company restricts your access to all the available cabs that could be out there for phone service. Many have realized the flaw in this structure years ago. If taxi companies do not consider themselves a service to the rider-ship, they should not control the manner with which riders phone the taxis for pickups. A solution was offered years ago called Centralized Dispatching. Many drivers supported it. Politicians supported it in the past and some still strongly do today. But the taxi companies have fought against it, and still would today. Centralized Dispatching could require the City’s cab companies, in addition to their branded company names, to also be tied into a central system. This way, if passengers requesting cabs by phone didn’t care which cab company it was, as long as one showed up, they could request the closest available cab, without having to pick a company. They have no incentive to provide you with good customer service because they do not consider you to be their primary customer. Again, that’s the logic addressed behind Centralized Dispatching. Some young, entrepreneurial types have tried to resolve this through apps like Cabulous or Uber. However, my opinion is their growth must accelerate to have more viable impact. Also, most of the City’s senior citizen riders on Paratransit do not typically own smart phones. A general, and often widely held perception is governments that regulate industries often give in to the pressures of big businesses. In this case, that would be the City and County of San Francisco caving in to the pressures and interests of the cab companies. For the record, there are other reasons that contribute to the difficulty of getting good cab service by phone, although I think lack of Centralized Dispatching is the main one. But sometimes taxi drivers accept a radio order and then flake on it. Simple as that. I wanted to add that to be fair as it was not acknowledged in the original comments. Also, because of the lack of Centralized Dispatching, sometimes passengers try to create central dispatching by themselves by calling more than one cab company and then boogie into whichever cab shows up. This sometimes makes cab drivers less willing to take radio calls. And, because of the uncertainty of cab service by phone, sometimes passengers flake the same way drivers do. And this also can make drivers less willing to respond to radio calls. I think Centralized Dispatching should be required of all SF cab companies. And, taxi apps for smart phones (I-Phone and Android) should be required in all cabs. It is not enough simply to put more cabs out on the streets, as the cab companies keep saying. This is always their solution to the problems you're inquiring about because they make money from leasing cabs to taxi drivers. Remember they do not make money from the volume of your rider-ship. More cabs on the street means more money for them because of the added number of cabs they would have to lease to taxi drivers. However, cab drivers often fear the increased competition would add burden to their livelihoods. While I feel there's some validity in the anecdote that more taxis on the street could make more people take cabs, it has to be coupled with vast improvements to the dispatching systems. Drivers need a better way of accessing fares through phone orders with their customers, and vice versa. Passengers can write to the SFMTA Board of Directors, to and to the SF Board of Supervisors regarding these matters. This is one of my pet peeves: When I first moved to The City in the '70's I could rely on getting a cab home from the grocery store. Now one cannot at all rely on being picked up at a grocery store. What changed? It feels to us, customers, like having more cabs would mean you would all make more money and we could get home from the grocery store. What do you and cab drivers think? First, go to Yelp and see which cab companies actually get the most good reviews, bearing in mind that all companies have bad reviews due to people's frustration with getting a cab at 6pm Friday night. I dispatch at a smaller company that has loyal riders that we go out of our way to accommodate, even on the busiest nights. But they don't just call us on that busy night; they call on Tuesday mornings too. They build a reputation with us that they will wait, and at least call us back if they get another cab so we don't waste our driver's time. I work graveyard shift, and I telephone all my callers when the cab is near, and if they are in the deep Sunset say, I call them back with an estimated time of arrival. That is unworkable during the busiest times, but folks appreciate the effort. We also use voice dispatch, looked down upon by the City as antiquated, but it offers immediacy and intimacy that voiceless dispatch cannot match. Voiceless dispatch cannot plead with and remind drivers to pick up the regular callers who support us through the barren times of winter like I do. Regarding more cabs leads to more money as per Melody: I've always had a hard time believing that, and indeed in places where they've tried flooding the streets with extra cabs, it hasn't worked. Drivers make less, increasing their motivation to take riders "the long way" to increase the fare, and the maintenance of the vehicle suffers, as does insurance coverage. Become a loyal, regular rider with a company that can recognize you and acknowledge that to the drivers, and take cabs for more than trips to/from the grocery store. I don't know what business you are in Melody, but I bet, given a choice, you'd opt for making more money than less. As a long-time driver, I pick up closest to where I drop off, limiting my unpaid downtime. That includes grocery stores. My advice to anyone relying on taxis for shopping purposes is to think like a cabby to increase your chances of getting your cab quickly. I don't mean screaming, ranting and honking at the shopping cart in front of you, but shopping at times that are not insanely busy for drivers. We get calls to supermarkets at 6 pm Friday night, and a driver isn't going to pass people on the street flagging at him/her to go to a grocery store where the time commitment is great —minimum of loading and unloading bags— but sometimes the folks call from the checkout line before they are ready to go. Also, the trips are generally short since folks typically shop nearby to home. Like most people, cabbies prefer to make more money than less, so time and labor intensive, short distance trips don't entice us during busy times. Any weekday morning or night between 8am -9am or 3 or 4pm - 7 to 7:30 pm will frustrate you to no end at a supermarket. Good luck and thanks for supporting cabs; a wonderful part of the urban experience that needs rider input to continue to improve.